"Faster! Move as if the Didact himself were watching!" Gek 'Lhar was a Sangheili Commander serving in the reformed Covenant and Jul 'Mdama's lieutenant during the Requiem Campaign. Gek 'Lhar was born October 19, 2499 on the island of Alytcos on Sanghelios. 'Lhar served ruthlessly in the Covenant during the Human-Covenant War. By 2556, he led an unruly group of salvagers. By this time, Gek had also come to work for Jul 'Mdama and his new sect based out of Hesduros. Gek was tasked by Jul with securing weapons and ships for the new Covenant. In January of 2557, Gek and his crew ambushed the salvage crew of Ram Chalva as it was returning from a fortuitous trip to Mesa. Ram was captured and kept as a prisoner on Gek's war-freighter. After the capture of Chalva, Gek directed his crew to make for the world of Laconia, where a CPV-class heavy destroyer named Proclamation's Tithe lay untouched since the war due to the rumored presence of many Mgalekgolo still aboard it. Gek's crew arrived at the scene just before the human salvagers of the Ace of Spades did, who had the aim of finding a certain log buoy that must be on the ship. Gek had readied eight of his Sangheili to explore the downed Covenant vessel but they had still only gathered outside of it by the time the humans arrived and sent two of their own to covertly explore it themselves. The two just managed to miss Gek's crew, leaving after the eight finally entered. By then, Gek was well aware of the humans presence and in order to make them reveal themselves, he released Ram Chalva but personally pursued him across the flats, all the while firing shots in his direction. The human captain, Rion Forge, directed her ship to swoop in to collect Chalva and this exposed them to plasma fire from Gek's war freighter. In addition, the Sangheili secured three dropships from the Radiant Perception and sent these to bear on it as well. The humans managed to rescue Ram and escape the system regardless. Gek ordered a pursuit of the human Mariner-class transport ship. The war freighter followed it to Arcadia, where it then jumped to slipspace once more based on the record of the log buoy taken from Radiant Perception. The Sangheili followed them in this as well but arrived at the destination-a debris field in the Korinth Prior system--before his prey. A large piece of rock with sufficient gravity and an apparent atmosphere formed from still-active Forerunner technology on it drew his attention and he ordered to set down on it, where he then disembarked. Gek hid within the dark interior of an ancient structure and waited for the humans to arrive and come to explore the same site. Rion and an ex-Marine named Cade were ambushed by Gek, who threw Rion against a console while Cade was forced to deal with his underlings outside. Rion eyed a luminary behind Gek that he must have come by either on Laconia or there. She had been holding out for a luminary as well, but her translation software in her earpiece did not give her much hope of trying to make Gek and offer for it, as he was incensed at her very presence within a holy relic. Suddenly, a voice from the console drew his attention, as it had seemed to address the human, making him both awed and furious. He dodged a shot from the human, which pinged off his armor, and missed a swing of his energy sword at her as well. He ordered two of his crew with him to make for the entryway to deal with Cade, but he had enough warning to lay a thermite trap for them. Cade turned to come back where Rion was, however, and before he knew what was happening Gek had turned and plunged his sword into the human's chest. Horrified, Forge jumped on Gek's back and fired her M6 series magnum at his skull at the same time as Gek struck her across the head with his forearm. Her shot only sliced across his left eye, but it blinded him permanently in that eye. Roaring in pain, he slung her over his head and slammed her against a wall. He was going to finish her off, but she readied a grenade threateningly, signaling she was willing to kill the both of them if he approached. At this, Gek opted to leave her as is. He took the luminary and exited the structure, but not before ripping Cade's dog tags from his corpse. In December 2557, Gek carried out a terrorist attack on Earth. Fireteam Apollo was warned ahead of time of where Gek would be by Rion Forge who was hoping that the Spartans could stop Gek for good and thus end his bounty upon the Ace of Spades crew. He was subsequently detained and interrogated at ONI's Midnight Facility; however, he managed to escape in February 2558, killing several of the facility's personnel in the process. Gek and Jul 'Mdama overlook Galileo Base. During the Requiem Campaign of early 2558, Gek greeted Jul 'Mdama as he arrived at his location in the Librarian's Rest on Requiem, informing him that they were still preparing "the shrine". Jul then brought Doctor Henry Glassman, who had offered his knowledge in exchange for his life. Gek was later tasked to watch over Dr. Glassman as he tried to work on their Forerunner "shrine". When Jul came to check on his progress, Glassman got frustrated and started to walk toward Jul. Gek quickly pulled his tether to get him to stop. Joining 'Mdama on watching the assault on Galileo Base by their Covenant faction, Gek was informed that 'Mdama was only trying to create a show of attempting to recover the Didact's Gift, making it seem important to the humans. Back at their base of operations somewhere in the tunnel complex of Sniper Alley, Glassman managed to somehow activate something in the shrine, prompting all the present Sangheili—save Jul—to bow to it. Noticing none of the Sangheili were holding his collar now, Glassman fled the antechamber in fear. As Jul tried to touch the artifact's energy sphere, it physically rejected him, prompting the Sangheili Commander to direct his fury at Glassman, who was now gone. Half-dozen of the present Sangheili gave pursuit to the doctor but Jul held Gek back. After being told Glassman's escape was unacceptable, Gek reassured Jul that he would deal with the matter personally, leaving Jul and his two guards with the artifact. Gek soon found Glassman's discarded collar and decided to activate a remote detonator for Glassman's explosive harness, but Spartan Gabriel Thorne managed to pull off the harness in time and toss it toward Glassman's pursuers, killing them all in the explosion. Gek was able to observe the aftermath and not long after, picked up the trail of the fleeing humans. Gek and Thorne engaged in combat. Gek tracked Glassman and Thorne to the Quarry, and managed to catch the duo off guard with his Type-3 active camouflage. After simply throwing Glassman aside, he attempted to kill Thorne with his energy sword but the Spartan succeeded in kicking it out from Gek's hand. After a short close-quarters combat fight with Thorne, the Spartan attempted to smash Gek's head in with a large rock. However, the Sangheili warrior managed to overpower Thorne and smashed the rock over Thorne's chest and head. With Thorne stunned, Gek gained the upper hand and went to retrieve his energy sword. Glassman attempted to aid Thorne by grabbing the sword, but Gek stopped him by crushing the doctor's arm with his boot. Gek was about to execute Thorne with his energy sword when the rest of Fireteam Majestic arrived and Paul DeMarco shot Gek in the back with a burst from his BR85HB battle rifle, killing the Sangheili. Majestic then looted Gek's body, including his energy sword, his active camouflage, the dog tags attached to his armor, and a holographic map of Requiem. Gek harbored a deep-seated hatred for humanity and Spartans in particular. In early 2557, Gek was blinded in his left eye from a shot fired from an M6 series magnum by Rion Forge, which also left a large scar across his face. Gek was very aggressive and brash, although he was still very loyal to Jul 'Mdama. He was shown to be persistent, pursuing Dr. Henry Glassman and Gabriel Thorne, after they escaped from Librarian's Rest, across a desert on Requiem. 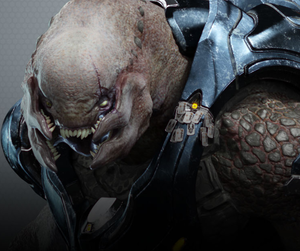 After unintentionally killing several allied Sangheili, 'Lhar was saddened by the losses and sought vengeance against those he deemed responsible. Gek donned the normal Sangheili Storm combat harness, despite being a Commander. Eleven UNSC dog tags (including one from Cade), were attached to the left side of Gek's harness; these were trophies taken from enemies he had killed, including a few Spartans. Gek often forwent wearing a helmet. He armed himself with a Type-1 energy sword and was equipped with a Type-3 active camouflage unit. Gek was originally supposed to have his own subplot in Spartan Ops, but the scenes were cut entirely since it was believed that they did not fit the same format the rest of the episodes followed. Another close-up of Gek being confronted by 'Mdama. Gek discovering Henry Glassman's vest detonator. Gek detonating Henry Glassman's explosive vest. Gek discovering he killed his comrades. Gek 'Lhar preparing to kill Thorne. Fireteam Majestic looting Gek's corpse.